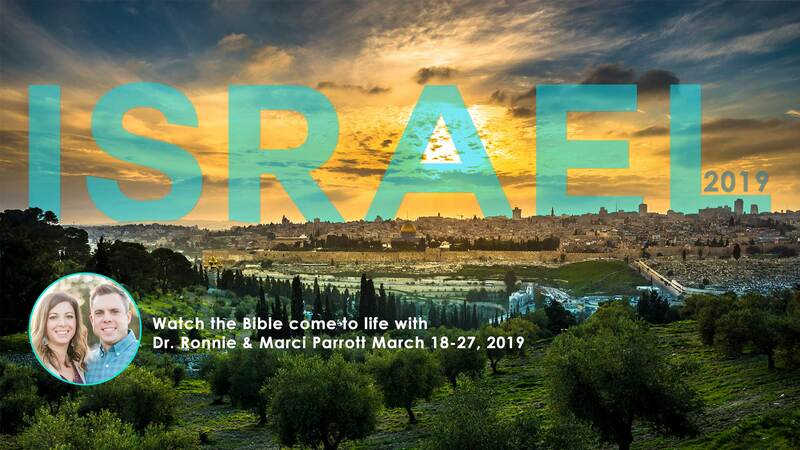 Pastor Ronnie and Marci will be leading a trip to the Holy Land next March, and they’d love to have you join them. You’ll spend time around the Sea of Galilee, Mount Zion, and Jerusalem. This is a great opportunity to see the Bible come to life! Depart from Charlotte (CLT) to Tel Aviv. SHALOM! Welcome! We arrive in the Holy Land this afternoon. Upon arrival at Ben Gurion Airport, we will be met and assisted through customs. We then proceed to our hotel on the shores of the beautiful, blue Mediterranean for dinner and overnight stay. Todays sites include Caesarea with its ancient seaport and Roman theater; Megiddo and the Valley of Armageddon; and Mount Carmel. We arrive in Tiberias at our hotel overlooking the Sea of Galilee for dinner and overnight stay. This morning we cross the Sea of Galilee by boat landing at Kibbutz Nof Ginosar where we will view an ancient boat that dates to Jesus' lifetime. We continue to Tabgha and the Mt. of the Beatitudes before arriving at Kibbutz En Gev for a lunch of St. Peter's fish. Later we will visit Capernaum with its ancient synagogue. Time permitting, we will travel north to Caesarea Philippi and the mouth of the Jordan River. We end our day at the baptismal site on the Jordan River known as Yardenit. Dinner and overnight stay in Tiberias. This morning we travel south through the Jordan Valley to the city of Bet Shean and continue to Gideon's Spring at En Harod. We then go up to Jerusalem to the Holy City! Time permitting, we will stop at one of the many gift stores to shop before arriving at our hotel in Jerusalem for dinner and overnight stay. Today we drive to the top of the Mount of Olives for a view of Jerusalem before taking the Palm Sunday path to the Garden of Gethsemane. We have a very special prayer service in a private garden next to Gethsemane. We then enter the Old City through the Lions Gate and visit the famous Church of St. Anne with its rich, deep acoustics and the Pool of Bethesda. Later we make our way to the Sisters of Zion Convent to visit the site of Pilates Judgment Hall in the Antonio Fortress. We depart the city through the same gate and proceed to Mt. Zion where we visit the Upper Room and the Tomb of King David before ending our day at the house of Caiaphas. We visit the Jewish Quarter and the Western Wall. We then ascend the Temple Mount and view the Dome of the Rock, the Al Aksa Mosque and the site where the Temple stood. We depart Jerusalem and proceed through the Judean wilderness to Qumran, the site where a Bedouin shepherd found the Dead Sea Scrolls in 1947. We travel south along the shore of the Dead Sea on the lowest road in the world to Masada, truly a remarkable piece of history. En Gedi, a beautiful oasis on the shores of the Dead Sea, is our last stop before returning to Jerusalem for dinner and overnight stay. Today we visit the Garden Tomb for an exciting time of praise and worship. We will view Golgotha and then tour the Garden itself with a visit to the empty tomb. After lunch we will visit additional sites to be determined by our guide before returning to our hotel to freshen up and have dinner before checking out. We arrive at the airport for our overnight flight. This morning we arrive home. We will return with memories and new friends to last a lifetime and beyond! ▸ Read full tour terms and fine print. SIGHTSEEING: Local transportation is by deluxe, air-conditioned motor coach. The services of an English speaking guide, entrance fees to places visited on sightseeing described in this itinerary are included in tour price. PASSPORT: A valid passport is required and must be obtained in person by each tour member. No visas are required for Israel. A valid passport is required to leave the USA. It should be valid for a minimum of SIX MONTHSafter your return date; you will be denied boarding if your passport is not valid for SIX MONTHS beyond your return date. AIRLINE SEATS: Seats without a deposit must be released 100 days from departure. If you cancel your airline seat with DC&T in writing within the 100 days there is a penalty of $100 per person.